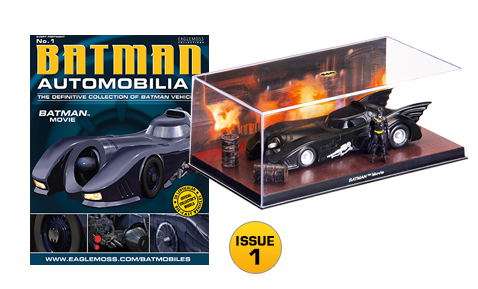 Subscribe to BATMAN Automobilia – The Definitive Collection of BATMAN Vehicles today and receive the iconic Batmobile from BATMAN™ The Movie and the first collector's magazine for FREE, only pay $4.95 for shipping and handling. 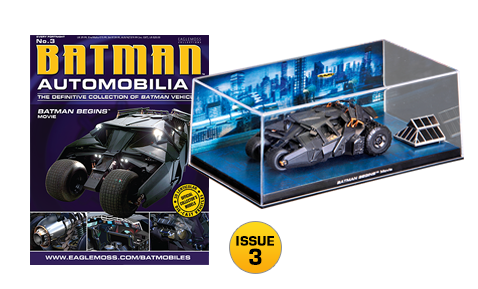 You will then receive 2 Batmobiles per month, with their accompanying collector's guides for just $19.95 plus $1.95 shipping and handling each. Amazing value for die-cast models of such exceptional quality! of Batmobiles at your fingertips! This high-quality binder can hold up to 16 issues! plate from the Classic TV show Batmobile. The BATMAN Movie Batmobile under attack and in armour mode. Comes complete with figures of the Joker’s goons. Add this superb limited-edition die-cast car to your collection. 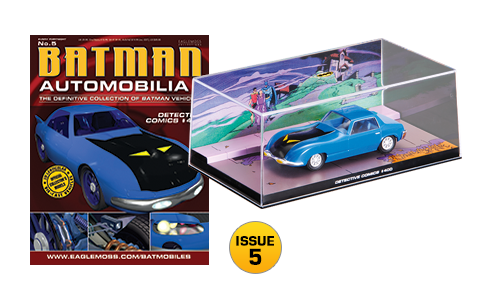 Soaring over the rooftops of Gotham City, this superb die-cast model of the Batwing comes in a large crystal case with a specially designed stand. 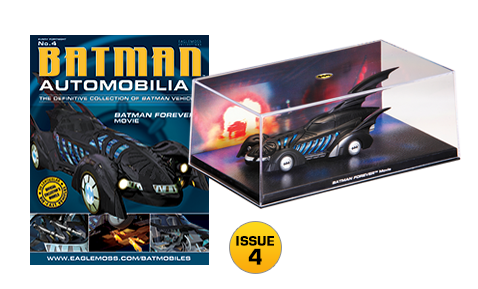 The limited edition model is a highly detailed replica of the Batwing from the BATMAN Movie! As a subscriber to the collection, we will also make some variant models available to you. There are 60 Batmobiles planned for the collection – click here to see the full list. 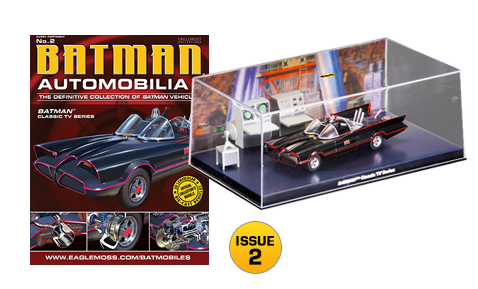 Order today and get the first model, magazine & collector's guide for FREE, only pay $4.95 shipping and handling. We will then send you 2 models a month, for $19.95 each, plus $1.95 each for s&h. With each shipment you will also get 2 FREE magazines and periodically our collector's club FREE GIFTS. Absolutely no commitment: You can cancel anytime by calling us, no questions asked! We have a 30-day money back guarantee. If you are not completely satisfied with our models, we will refund their value (less Shipping & Handling)! Each issue comes with a fascinating & informative magazine. If you'd like to hear from us about future issues, launches, offers and more, please sign up here and we will send you a regular newsletter by email. Thanks! Join us on our Facebook page for some artworks, photos and news from our Editor. If you prefer we’re also on Google+ and are showing some cool images on Tumblr. Keep an eye out for our competition where you can have a lot of fun and win some cool prizes!